The resource is vital in the current climate of fear and mistrust about the Islamic faith where children and young people are regularly exposed to negative stereotypes about Muslims and misunderstandings about Islam, which has led to reports of growing discrimination and hate crimes. Due to be launched on 6th February in London, The 99 Names of God aims to counter these pressing issues by offering an enlightened and holistic interpretation of Islam that is grounded in a profoundly spiritual ethos. It will show young Muslims and non-Muslims that the principles of compassion, equality and love are at the heart of Islam through historical examples and an examination of positive Islamic teachings. Written and beautifully illustrated by Daniel Thomas Dyer, this family resource can be utilised by both old and young. It teaches an inclusive approach to Islam by highlighting the faith’s rich treasury of female voices, encouraging a philosophical attitude, promoting an appreciation of other religions and nurturing ecological as well as social awareness. “This ground-breaking family resource encourages children, parents and teachers to balance reason with intuition, critical thinking with creative imagination, social activism with self-examination and ritual prayer with meditative techniques” said Saimma Dyer, Managing Director, Chickpea Press. The inspirational content provides uplifting food for thought as a guiding light against negative representations of Islam and divisive political rhetoric about Muslims, offering snapshots into the positive culture and legacy of Islam. This is vital in the present day as it will help embolden all children through increased religious literacy, which can counter narrow interpretations about Islam and its key religious figures. In particular for Muslim children, it will be a resource which can aid pride and confidence in their heritage and spiritual identity. This will build resilience against Islamophobic sentiment and break down barriers and social divisions, helping to build a better future for a shared multi-faith world. 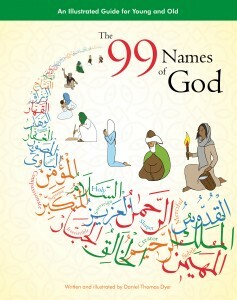 For more information about the launch of The 99 Names of God see the invite. Launch will be on 6th February, 6:30pm at St Ethelburga’s Centre for Reconciliation and Peace, London. More information.